I love doing Scottish research and find these two books invaluable. Both are by Chris Paton and are in the Unlock the Past family. Down and Out in Scotland, researching ancestral crisis, covers such interesting topics as Illegitimacy, death, law and order, poverty, debt and medical problems. Explanations of how these were dealt with and where to find information will have you looking for a bit of a scandal. Discover Scottish civil registration records. 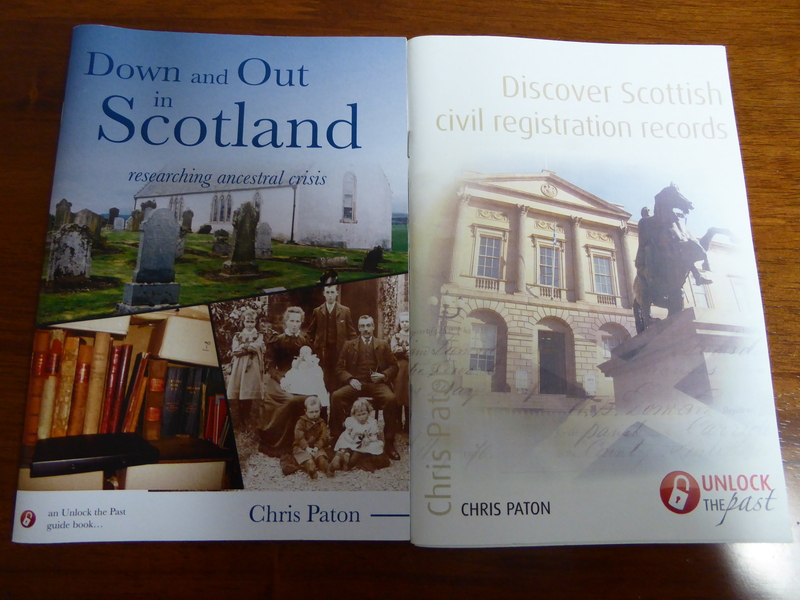 This book covers civil registration in Scotland in Part 1 and then Registration in the British Isles in Part 2. Did you know that our ancestors had vaccinations? I didn’t and this book explains how to locate and use vaccination records. Covering births, marriages and deaths this book should help with finding records. « Palaeography	» It’s not all online!